According to the Massachusetts Department of Environmental Protection (MassDEP), the process of water main flushing is one of the most critical practices carried out by public drinking water systems. 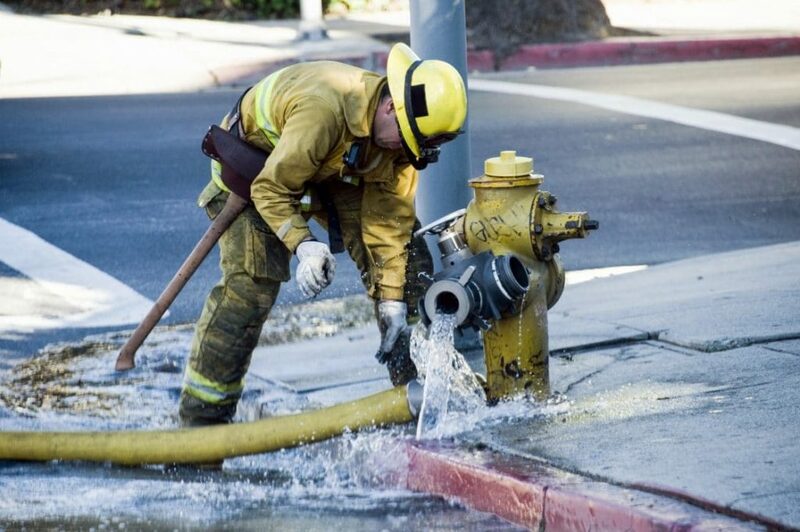 This practice allows water operators to identify broken or inoperable valves and hydrants to assure that they are working at their maximum potential. During the flushing of a hydrant, operators can assess the water pressure and available flow rate for firefighting purposes. It’s imperative that each hydrant is operating as firefighters rely on them for fire-ground operations. Over time, water settles, ages, and is affected by biofilm (a thin layer of microorganisms) that grows on the inside of the distribution piping. Each of these factors affects the quality and taste of the water, so it is important to flush the water out of the mains and hydrants regularly. 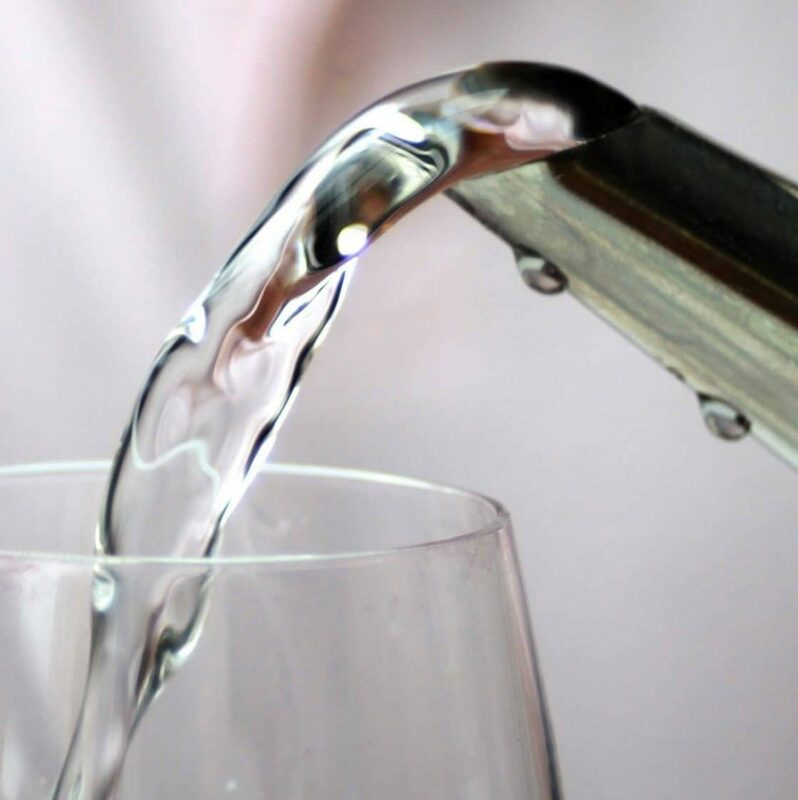 Flushing can remove water from areas of the distribution system that have low water use, since the older water may no longer have the desired chorine residual. Throughout the course of several months or a year, loose sediment and mineral deposits may slowly build up inside of the water mains resulting in discolored water and reduced capacity. Flushing the water mains can remove the sediment and mineral build up, and improve the color, odor and taste of the water if it has been problematic. Unidirectional flushing at the minimum required velocity will improve the carrying capacity of the mains. Now that we’ve discussed the benefits of flushing our water mains and hydrants, you may have some questions about the process and how it will affect your day-to-day life. We’re here to help! When will a hydrant near me be flushed? Hydrant flushing normally takes place at the start of spring. Your Pubic Water Supplier (PWS) should notify you of what streets will be undergoing flushing and when. What can I do to prepare for flushing? Prior to local hydrants being flushed, you may want to obtain water (in pitchers prior to flushing) for your everyday use including drinking, cooking, etc. When the flushing is taking place, water quality may temporarily be reduced. Using water for tasks such as dishwashing, laundry, or showering may result in the discoloration/staining of your clothes or household items. Plan ahead and be sure your laundry and dishes are done before the flushing process begins! How does water main flushing work? Water main flushing usually takes place in one of two ways – conventional flushing or unidirectional flushing (UDF). WATER Finance & Management does a good job describing the difference between the two methods. 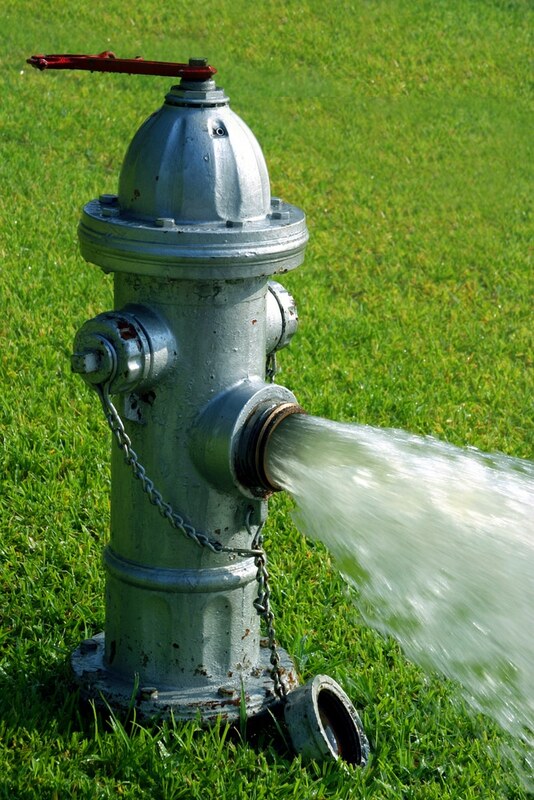 In conventional flushing, hydrants are opened in different targeted areas and discharge water until accumulations are removed and water runs clear. While easy to conduct by water operators and crews, this method requires a lot of water, and may not always clean the pipe completely. With UDF, each pipeline is isolated to create flow in a single direction and quickly clean the pipe. 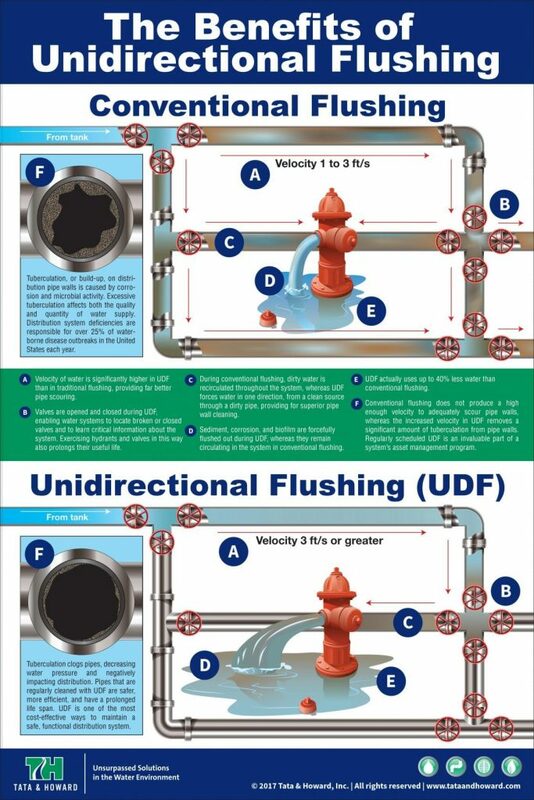 By concentrating the flow, UDF creates higher velocities to clear the pipes and requires less water. Learn more about the benefits of unidirectional flushing in our infographic here. How will flushing affect my water? During the process, you might experience a difference in the water pressure in your faucets as well as some discoloration in the water. How long does it take to flush the hydrant? Typically, this process takes between 30 and 60 minutes. When will my water be back to normal? Once the hydrants in your area have completed their flushing, it won’t be long until your water is ready for normal use again. In most cases, water should run clear with just a few minutes of faucet flow. Turn your faucets on cold and let the water run for 5 minutes or so. If you are still seeing discolored water or sediments in the water, continue running cold water on all your faucets until it is clear. Should your water still be discolored after several hours, please contact your water supplier. Is water main/hydrant flushing a waste of water? Although you will see water flowing for up to an hour, rest assured that most of the water that was flushed will return to a river, stream, or aquifer. Flushing is a necessary process to help keep our water mains clean and clear of sediment, allowing your public water supplier to provide excellent water quality, and increased pressure and flow. For more information and tips like this, be sure to subscribe to our newsletter!